Use the links below to learn more about botany and the vegetation and flora of British Columbia. 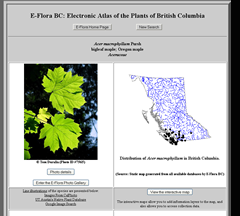 The E-Flora atlas pages provide detailed information on British Columbia's plant species. To access the pages, conduct a species search using the 'Species Search Page' button below. You can search for a single species or a group of species. Use our quick search feature in the window below to call up atlas pages for single species. Quickly search for a BC plant species using either its English common name or its scientific name (Genus or Genus species). E-Flora BC is a work in progress, a 'living book' that will be updated continuously. Presently, E-Flora contains more than 8000 atlas pages, covering all vascular plants, all macro-fungi, most lichens, and more than one hundred bryophyte and algae species found in BC. We are working towards developing additional atlas pages. The Macrofungi of Haida Gwaii:. Visit the web page and view the species checklist. More that 10,000 photos of vascular plants, mosses, liverworts, lichens, fungi and algae can be found in the E-Flora Photo Gallery. Would you like to contribute photos to E-Flora BC? If so, please use the link below to register. After you receive your password you can upload your photos. Read our guidelines and FAQs for photo submissions and photo use. © Copyright 2008 E-Flora BC. All rights reserved. This page has had hits since November, 2007.